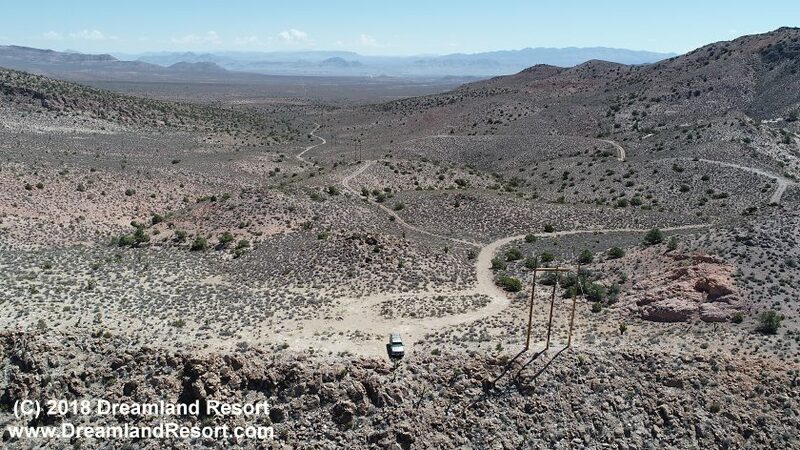 The awesome view below over Tikaboo Valley and the mountains around Area 51 is your reward for a somewhat rough 4-wheel drive, about four miles into the mountain range behind the Black Mailbox. The spot, which did not have an established name, is right where the power lines to Rachel cross the ridge. So we have named it the Powerlines Overlook. The distance to the Base is about the same as from Tikaboo Peak, 26 miles. And, although you can not directly see the base from here, the advantage of this location is that you can drive right up to it. There is also plenty of level ground for camping. The Powerlines Overlook is an excellent scanner location. Due to the high elevation you pick up radio traffic from most of the ranges, including ground traffic from Groom. With a decent scanner you can even pick up the Area 51 VOR on 117.500 MHz from here. You have an excellent view of the Groom airspace down to a few hundred feet above ground, and you can see Janets fly in and out of the base from here. At night you can see the white light of the Papoose Radio Facility in the mountain range behind Area 51. On some nights you may see a faint glow below and to the right of that light. That is a reflection of the lights of Area 51. It is especially prominent when the floodlights at the Janet terminal are still on (until the last Janet leaves shortly after 8PM). You also have a clear view to the east, towards Crystal Springs and the area known as Texas Lake by Air Force pilots. This is where during Red Flag exercises one of the teams usually sets up formation. We have seen various aircraft flying very low overhead here on their way into Tikaboo Valley, including B-52, C-130 and F-16. The 4.2-mile access road to this lookout point starts at Horneys Rest Stop (near Hancock Summit, between Hwy. 375 mile marker 38 and 39). Take the dirt road in the back of the rest area and keep left at the fork after about 0.7 miles. Then just follow the main road, which merges with the power lines, then leads along the lines up to the top of the ridge, where it ends at a level area right next to the power lines. The last part has some steep climbs and requires high clearance and 4-wheel drive. It is not recommended in the dark or after heavy rains. Powerlines Overlook: N 37�.541' W 115�.437' Elevation 5740 ft.
Aerial view of the Powerlines Overlook and of the road leading up to it. The Hiko/Crystal Springs area is visible in the background. Click to enlarge. Wide-angle shot from the Powerlines Overlook. You are at the upper end of a wash, looking southwest over Tikaboo Valley. 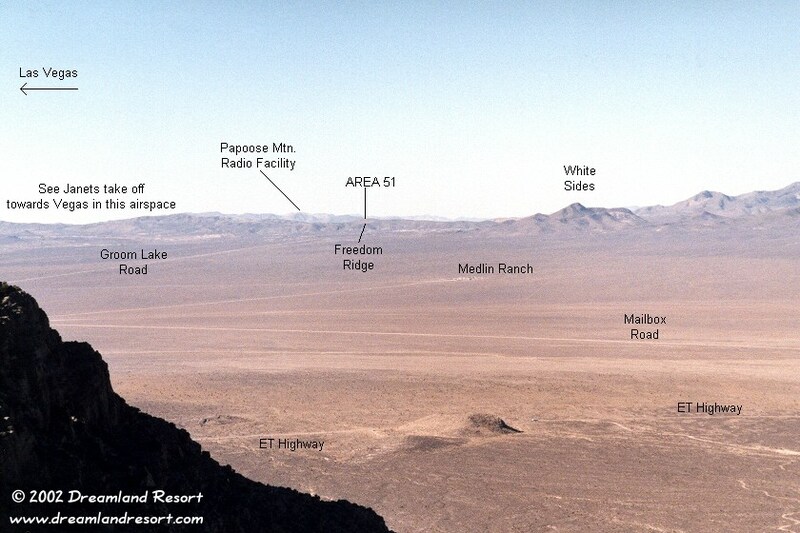 The view to the sides is somewhat limited by hills, but as you can see you have an excellent view of the Area 51 airspace and most of the Valley. 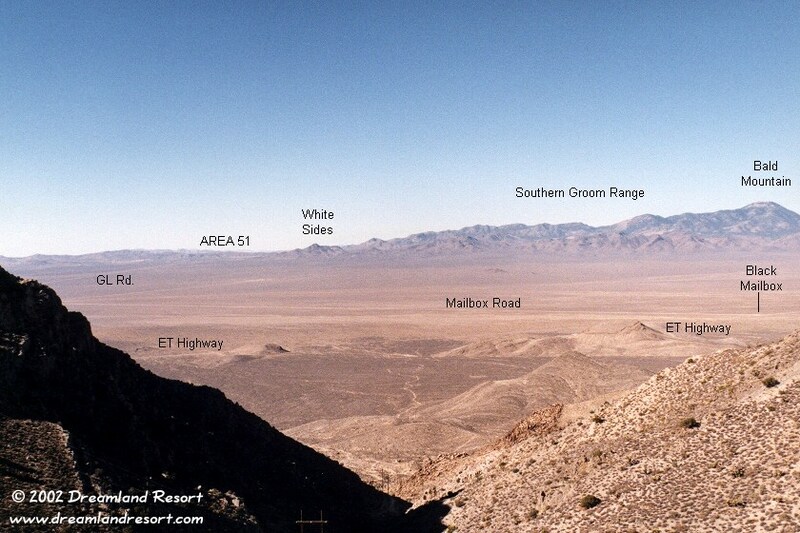 You can see Groom Lake Road, the ET Highway, the Black Mailbox, Bald Mountain and the southern Groom Mountain Range. And of course you have an excellent view of the Area 51 airspace, up to approximately 750 feet above ground. In this photo you can clearly see the ET Highway left to right in the foreground, Mailbox Road and the Medlin Ranch. Behind the ranch are the former view spots Freedom Ridge and White Sides. Ironically Freedom Ridge now obstructs the view to the base from here. At night you can see the glow of the lights at the Janet terminal right behind it. Las Vegas is to the left, and sometimes you can see Janets landing on Runway 32 or taking off on 14 low over the hills behind Groom Lake Road. This close-up shows the location of the Groom Lake Road signs, as well as the Papoose Mountain Radio Facility. 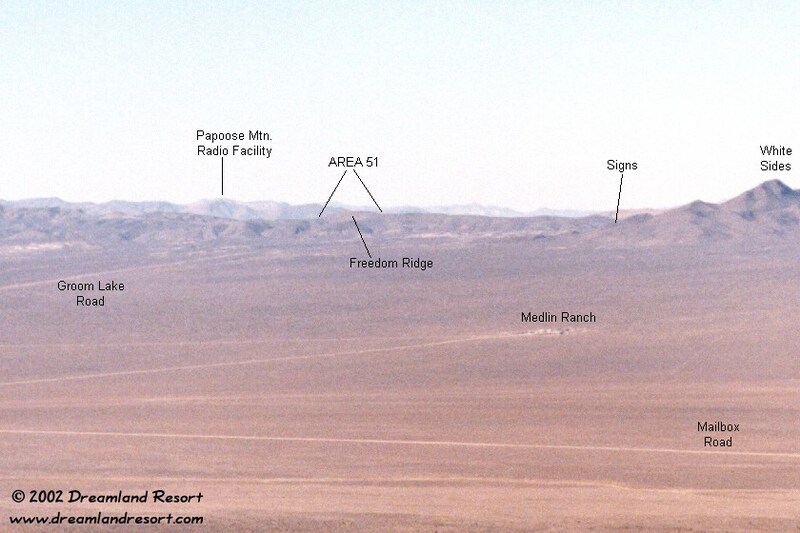 Area 51 lies just behind Freedom Ridge.